Nestlé is a major Food & Beverages brand; it is 140 years old and claims to have a factory or operations in every country of the world. For a company so widespread, boycotts are imminent from some or other fraction of the world. Nestlé has been facing boycott campaigns since last 30 years. Over years the campaigns have become more widespread, and have gained momentum from time to time. With advent of better communication technology like Computers, followed by Internet, Mails and now the Social media; the reach of these boycott campaign is ever increasing. Greenpeace an international organisation, decided to bring attention to what it deemed as ‘harmful to planet’ activities of Nestlé. Greenpeace investigated and summarized that one of ‘Palm Oil’ suppliers of Nestlé is felling rain forest to clear out land for ‘Palm Oil’ plantation. Due to this felling of rainforest, the natural habitat of many animal species was being threatened. To create awareness about the damage being caused to the ‘flora & fauna’ Greenpeace created a video depicting the very famous ‘Kit Kat’ as being made of Orangutan flesh and blood. The video which could have easily died out, got snowballed and became a major controversy; and the credit for making it large goes solely to Nestlé itself. Poor media handling and disastrous technique of Nestlé’s Social Media Management Team made the company lose its face in public. Greenpeace conducted a investigation and brought out a report on a Indonesian company (Sinas Mas) that supplies Palm Oil to Nestlé; this report was about illegal destruction of rainforest by Sinar Mas. This illegal rainforest destruction was having a direct impact on the environment and the Orangutan populations. The report was followed by a strong video from Greenpeace. This video used one of Nestlé’s most famous product – ‘Nestlé Kit-Kat’. The video was based on the famous slogan of take a break take a Kit-Kat; using that slogan Greenpeace video showed a man taking a break and eating a Kit-Kat. However the Kit-Kat was depicted as being Orangutan’s finger and after the man bits into Kit-Kat; the chocolate is bleeding blood all over. The video was meant to evoke strong sentiments and that it did. The explicit video was meant to bring in focus the linkage of ‘Nestlé’ and the deforestation happening in Indonesia. Greenpeace followed up its initial report, with the strong video. But the organization did not stop there it kept going against Nestlé by releasing new evidence that linked Nestlé to illegal deforestation in Indonesia through, Sinar Mas. This kept the interest in the Nestlé Orangutan story alive. Greenpeace took hard stand against Nestlé on their blog, by going ahead to compare Nestlé against other Food & Beverages MNC’s stating “companies such as Unilever and Kraft were making efforts to disassociate themselves from the worst practices of the palm oil industry, Nestlé has done diddly squat,”. Finally the Greenpeace report, video & blog all combined together and brought Nestlé under public scrutiny. Since Greenpeace was being active in the virtual world, the 1st impact of its efforts against Nestlé was felt in Virtual world itself. A virtual boycott campaign began and Internet users start attacking Nestlé via their blogs, YouTube video’s and most prominently strong comments were posted on Nestlé’s Facebook page. Greenpeace’s Orangutan video garnered quite some viewership and was generating waves across the virtual world. The video was generating negative publicity for Nestle and this obviously didn’t go down well with the company. While Nestlé got the video deleted from YouTube, Greenpeace went ahead and posted the video on Vimeo, from where it went viral. 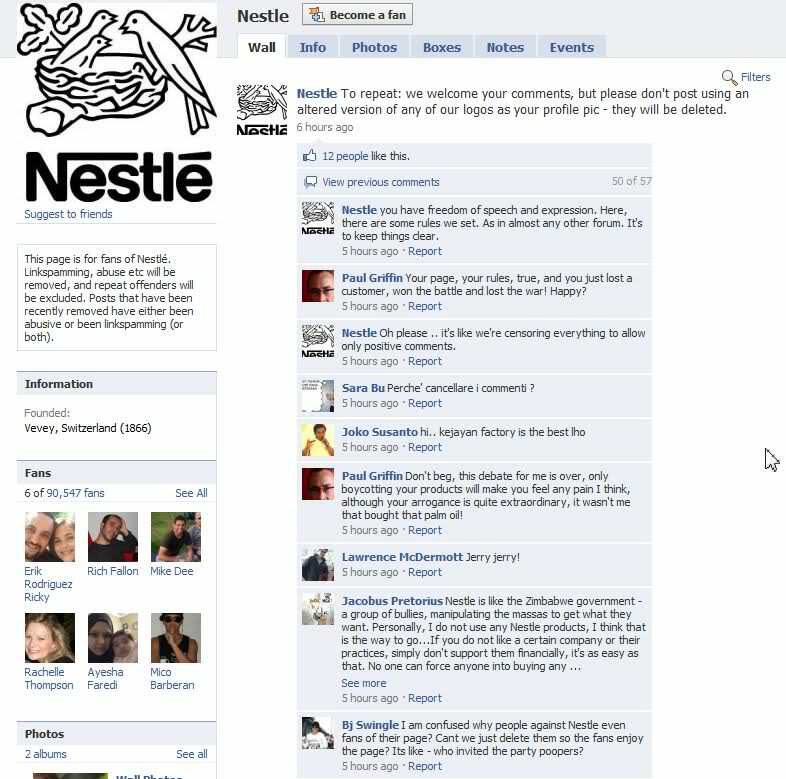 From there Greenpeace supporters flooded Nestlé’s Fan Page. Many Internet users had downloaded the Greenpeace video, prior to its removal by Nestlé. Once Nestlé got the Greenpeace video removed from YouTube users who had downloaded the video previously went berserk posting the video on numerous other video sharing site. This video caught media attention and came in public eye, this ensured that the video got viral; and news of Nestlé’s Palm Oil fiasco spread far & wide. The video was watched hundreds of thousands of times after being removed from YouTube. Nestlé’s reaction to the video only spread it far and wide. Social Mediascape started buzzing with criticism against Nestle. The criticism started taking solid form, with many boycott movements being called against Nestle. Social Media sites like Twitter, Facebook were all flooded with negative comments. This action by Nestlé doomed it in public eyes. In virtual world, freedom of expression is cherished by far the most Nestlé’s action was viewed as an attempt at censorship. This view of censorship added fuel to the fire and the boycott campaign spread forth like wildfire. At the time when this Greenpeace report started stirring public interest, Nestle had 90,000 fans on its Facebook page. 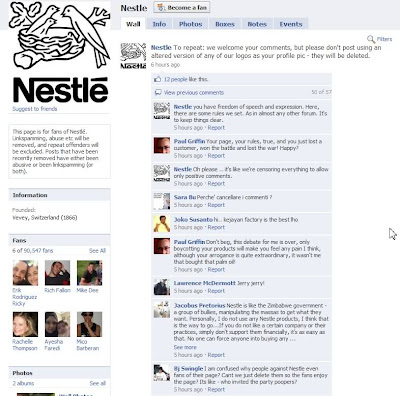 Once the video and report started gaining public attention; many Facebook users discovered the Nestle’s Facebook page as a good medium to vent their frustration about the company. Many Facebook users made their displeasure, and strong opinions known publicly on Nestlé’s Facebook page. Nestlé’s staff/ Facebook account management team’s reaction to these statements was very clearly ‘knee-jerk’ and unplanned. Nestlé’s Staff had geared up for war on its Facebook page. Their statements and attitude made it clear that the company was not going to bow down and exit gracefully. The Facebook management team were all set to start a ugly war of words that in the end left Nestle looking poorer than ever before. Nestlé’s page on Facebook was being flooded with strongly worded comments from various Facebook users who were not happy with Nestlé’s actions. Posting comments was the 1st step, many Facebook users went a step further to make their displeasure about Nestlé known, by using altered versions of Nestlé logo. 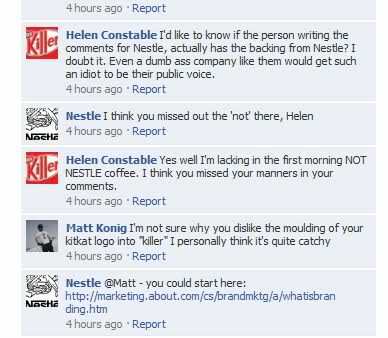 All the hostility from the Facebook users riled up Nestle’s Facebook Management team; and in the flow of things Nestle’s staff made many statements on their Facebook fan page, which were viewed as rude. This aggravated the situation for the company. Though Nestle did not respond immediately, but as soon as the protest against the company started to look serious Nestlé cancelled its contract with Sinar Mas( the company accused on destroying rainforests). Company could have used this move to its advantage; by acknowledging its mistake and showing proof that it was amending its ways. When at fault merely setting it right is not enough; apologizing and accepting the blame for the fault as well as gracefully bowing out is equally essential. While Nestle did set its mistake right by cancelling its contract with Sinar Mas; it forgot to do the apologising part. When the protest started gathering storm and customers started bombarding Nestle’s Social Mediaspace with scathing comments and call for boycotting the company; Nestle went bonkers under the pressure. Nestle could have worked with the people who were posting comments and interacting with them to create a positive media image; and send out the message to the society at large that the company ‘regretted its actions; and had taken all measures to set it right immediately’, also the company could have had invited comments and suggestions from the users to help in coming out stronger and more learned from this incident. However Nestle choose to defend itself; wage out a war against its detractors and generally run like a bull in china shop. It alienated the users and managed to project a perfectly deranged image of itself. Internet is vast medium, if you make a fault own it. Do not try to hide it. It will be found and you will be left red-faced. Accept the public criticism and anger graciously. Do not act defensive and immature. Do not enter into a debate/ fight with your customer/fans/followers/viewers. Always keep interacting with the people; own your mistake in public forum’s; apologise in public forum’s; announce corrective action in public forum; follow up on the action in public forum. Always keep the people involved, do not alienate them. Do not try to hide. Last but not the least, be careful of what you talk/post on Online Media. It will stay there to haunt you forever.